This lead in model of the Chatsworth park home range still offers a superb range of features and fantastic value for money. The whole Chatsworth range has been developed from ideas and inspiration gained by listening carefully to customers. If you choose a Chatsworth park home, you will benefit from Stately-Albions years of experience in the design and build of park homes. 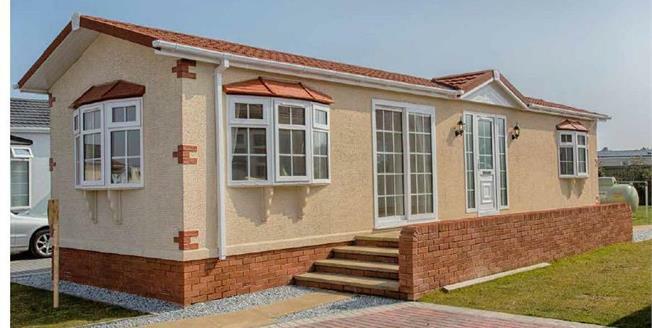 Set within an attractive rural park, this tastefully decorated detached park home offers ideal living for those aged 50 or over, tucked away off the main road offering tranquil living but also holding good access to the A49 giving an easy route to Warrington, Runcorn and Liverpool. The brand new accommodation comprises of an entrance porch, leading to the Hall, Fitted Kitchen and large open plan lounge/ dining area. This delightful property also offers two bedrooms, both with fitted wardrobes and bathroom. Externally there is a delightful patio area which also offers off road parking.